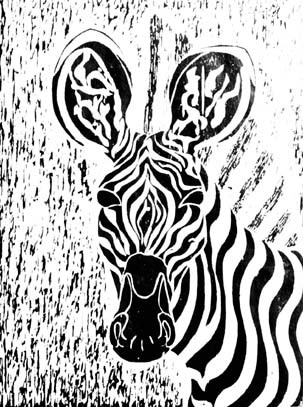 Endurance and strength, exploring the Zebra stripes as a design motif. Original printed on mulberry bark Japanese tan printing paper with bits and pieces of wood bark embedded in the paper. Edition size: 100. 50 Artist Proofs, printed on white Japanese printing paper. 14.5" x 20"